Perhaps they’re so old school that you truly don’t recognize them. They’re basically the first jelly candy-in fact, it says so right on the package. And since you know me, you know I have a pretty huge fixation on jelly candies these days, therefore it became a foregone conclusion that I’d have to bring it full circle and review these. These come in five flavors: Cherry, lemon, lime, orange, and…licorice. Bold! Very early-American using licorice in a mixed flavor variety, and I applaud it. I don’t think most people do, but it’s SO old fashioned (think Necco wafers, etc) that it’s actually edgy. It’s like wearing leg warmers or popping the collar of your izod shirt in 2015-so old it’s new. Each of these little sugar dusted lovelies is, as we’ve already established, a jelly candy. 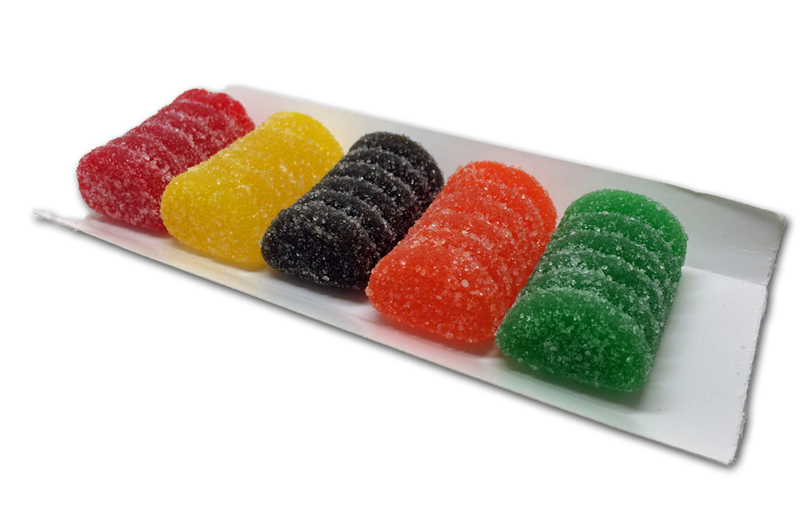 But they’re not like the French candy Pate De Fruits at all. While those are soft, silky, and…almost moist, Chuckles are….seriously firm. Almost hard, but in jelly form. Usually we’re banging the drum about candies not being hard enough, not chewy enough-but in this case…I aint banging that drum. 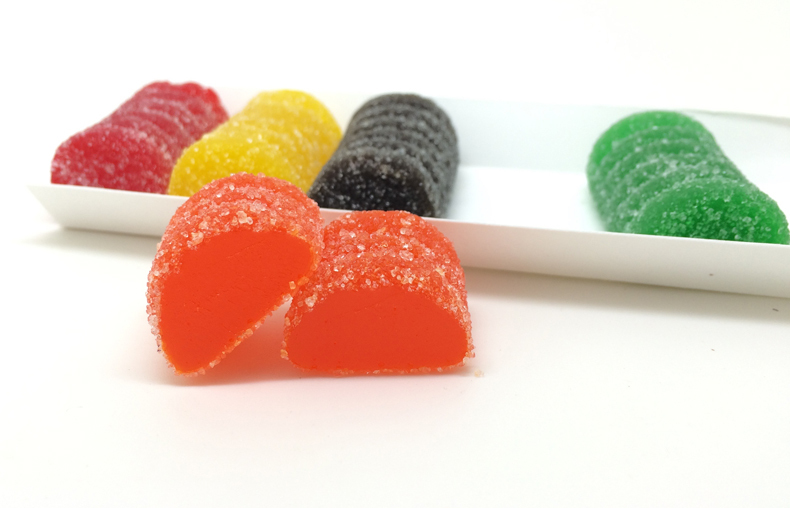 A quick note about modern day pate de fruit, or fruit jellies. Generally speaking, they’re made with the highest quality ingredients-the goal is for them to taste ridiculously true and luscious. Some great examples of that are Sugarfina’s Apple Pie, Cedrinco’s fruit jellies, Cheri’s desert harvest prickly pear cactus jellies, and the amazing Cranberry Sweets pates de fruits. Chuckles though? Not so much with the high quality ingredients. And thus, not so much with the outstanding taste. To me, these are…slightly nostalgic, but they don’t hold ANY of the allure and wonder I have for fruit jellies in general. Side note: last October, while between gigs, I attempted to make fruit jellies myself. 6 times. And I failed 6 times. They’re not easy to make well. In fact, I contacted some people from the companies I listed above, and even they couldn’t help me-they’re just not an easy thing to make at home, and even if you do pull it off, that magical consistency….you aint gonna get it. In fact, the head of one of the above mentioned companies told me he tried making HIS OWN recipe at home and couldn’t make it correctly. SO how the hell am I gonna pull that off? Mine were delicious, with great flavor combinations, but I just couldn’t get them firm enough, even with aging. So they turned out like slightly firmer cubes of high end jam or jelly. That I spent DAYS of my life trying to make. Chuckles fall on the other side of the consistency problem-they’re just super firm, kinda boring tasting things. Jonny Guru Jr. ADORES them way more than he likes high end fruit jellies, which is super weird to me. These are super synthetic tasting, very firm, sticky chews. 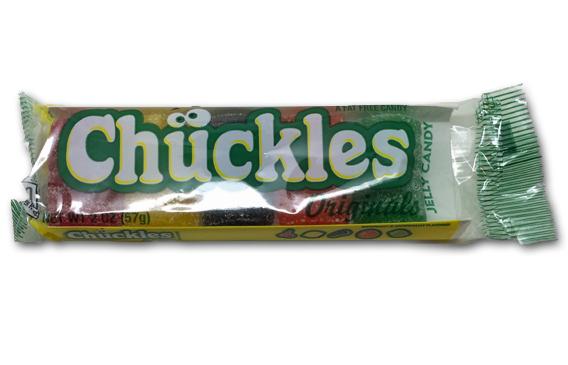 Chuckles probably hold a lot of nostalgic value for folks, and honestly, I didn’t even have that-I never really ate them as a kid. But I had to find out, …I found out, and now…I’m moving on. Not much to see here, but if you’re a Chucklehead, click the link before for a good deal. Yep, never liked them because they are bland and too hard a chew. My go-to fruit jelly (if i was still eating candy) would be Sunkist fruit gems. Were these ever made with salt instead of sugar? A friend swears she remembers them as salty. I can’t imagine that they were. In fact I’m sure they weren’t. Is it possible they’re thinking of a similar candy but not Chuckles? A salty Chuckles-type candy was given to the men who worked in the steel mills in Gary, Indiana during the summer, to keep their electrolytes balanced in the heat. But salt wasn’t substituted for the sugar. These were still sweet, with salt added. My dad used to bring some home for me. I loved them. It was the salty sweet flavor that’s so popular now, like salted caramel. I’d love to find them again. Wow! I stand corrected – that’s a cool story. Just bought some from amazon and they are sprinkled with salt instead of sugar. In my opinion not a great taste! My grandfather worked in the steel mills at Homestead Pennsylvania, he brought a pack of the salted Chuckles homes with him. He told me the mill supplied them to replenish the salt depletion due to the high heat of the work area he was working in.He also told me that they had to be careful how many Chuckles they ate because of the salt. Can’t agree with the nay sayers. 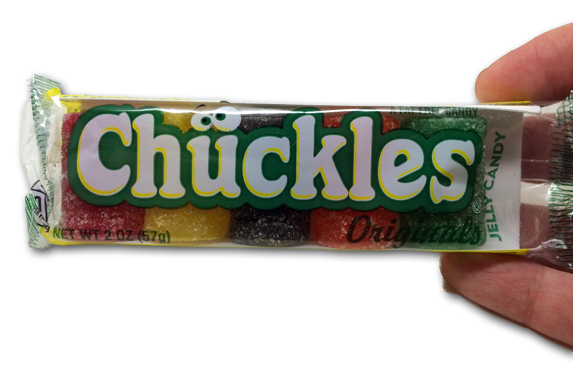 Chuckles were my choice of sugar as a young child and more so now! This past Christmas, knowing my delight in just finding chuckles for sale, I received a carton of 10 boxes, ( movie theater size). Lasted maybe a month! Lol. Searched and found available on Amazon, but the shipping doubles the price. Their my favorite, but because if shipping, guess I’ll wait till Christmas.! Fair enough: childhood candy bonds are unbreakable! Just tried them today and I never wanted to puke more in my life. I ate half of one then decide it wasn’t worth the calories.